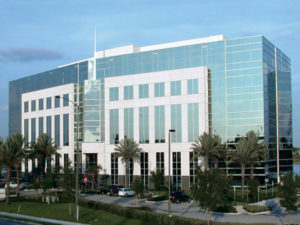 Virtual Office Orlando Millenia Blvd is located very close to the upscale Millenia Mall, right off the Interstate Road 4 as well as the Florida Turnpike, only 20 minutes driving time from Orlando International Airport. The ease of accessibility and the free parking around the building makes this facility a preferred choice for our customers. The large reception area is welcoming and gives a professional first impression to your clients. The first floor location of our office suites makes it even easier for your customers to visit you. Whether you want to start a virtual office plan at this location or chose one of our permanent executive office suites, you will be enticed by our professional staff to represent your company. Signup is an easy process and can be completely facilitated online. If you have any questions or would prefer to to visit the facility, please email us or call 1.866.793.7969, we will gladly arrange a tour for you with one of our managers. Once you decided on a suitable office plan for your business, you can easily add other virtual office services like live phone answering or virtual assistant. All without the big price tag or administrative concerns.